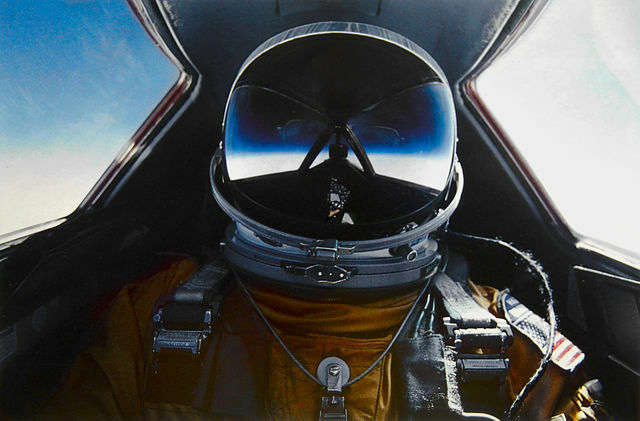 Pilot Brian Shul in the SR-71. Much has been written about the Lockheed SR-71 Blackbird aircraft. 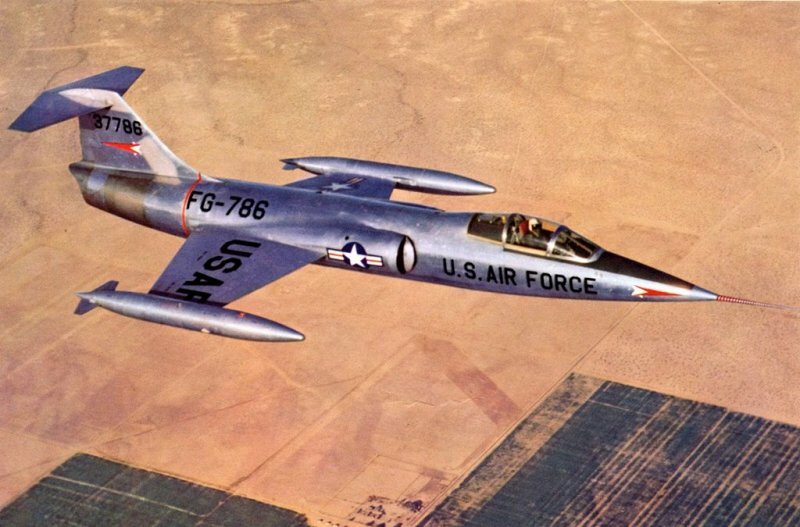 Designed in the early 60s, it still remains the fastest manned air-breathing aircraft (at least that we know about), with an official top recorded speed of 2,193 mph. Flying at about 80,000 feet, pilots were required to wear full pressure suits in case of a mishap which depressurized the cockpit. The aircraft was largely constructed of titanium and composite materials, and famously was designed in such a way that leaked fuel while sitting on the ground, in order to allow body panels to expand in flight from air friction. The 60s were the height of the Cold War, where the US and USSR continually pressed each other for advantage. The SR-71 was simply one of a host of incredible aircraft on both sides - one optimized for speed over all else (in fact, the aircraft was limited to 3g maneuvers to avoid engine flameouts). As such it was able to outrun both aircraft and surface-to-air missiles in the Soviet air defense system. 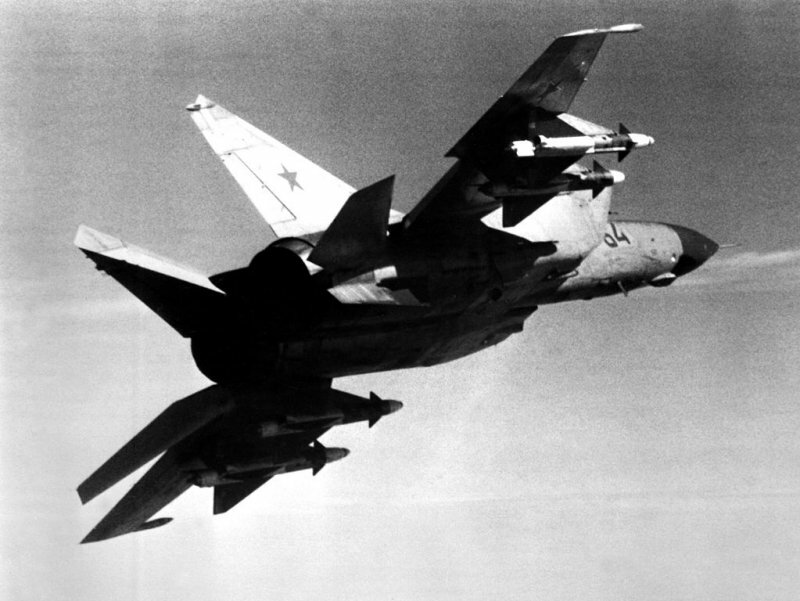 The MiG-25 "Foxbat" air interceptor was unable to catch the SR-71. The SR-71's contemporaries were designed to fight a war where bombers would attempt to fly into air-to-ground missile range of enemy territory, whereupon enemy interceptors would scramble in an attempt to shoot them down. 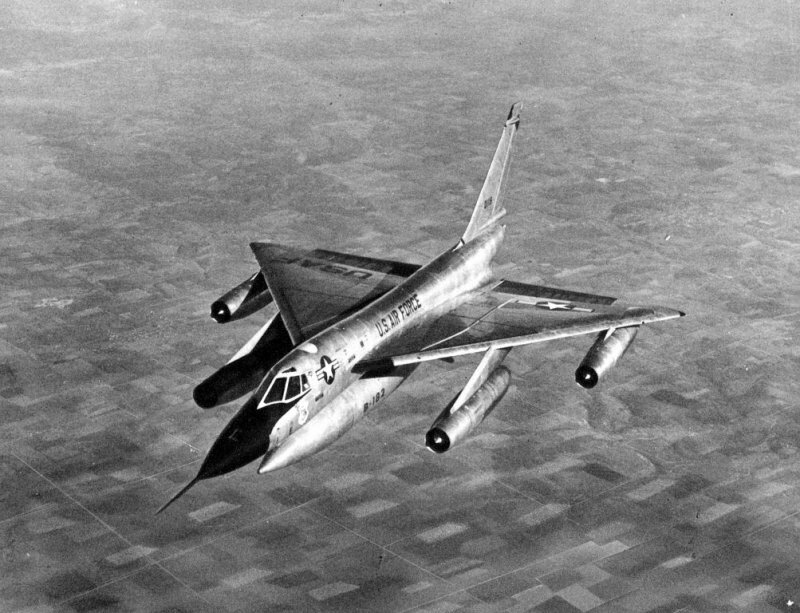 As such, these aircraft were all designed to fly faster than twice the speed of sound, and included the Convair B-58 Hustler bomber. . .
. . .the Lockheed F-104 Starfighter interceptor. 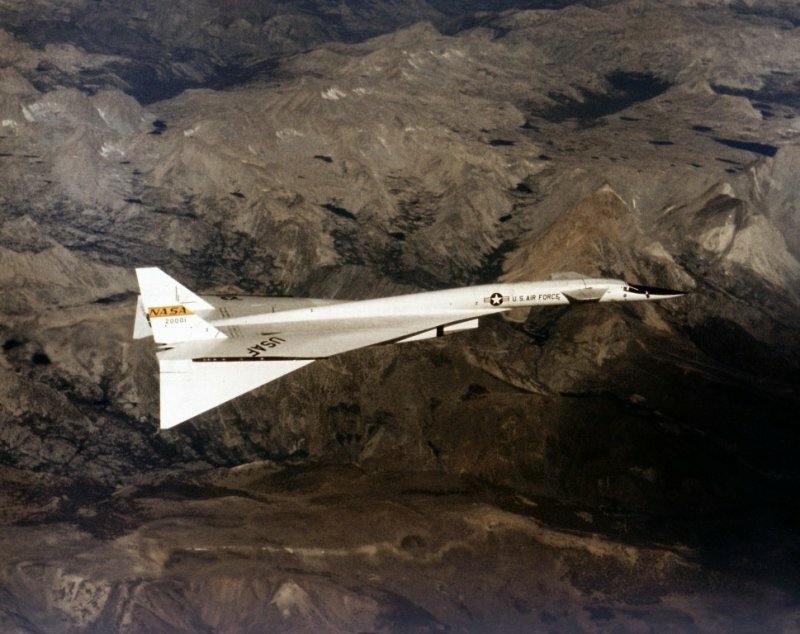 . .
. . .and also included experimental aircraft such as the North American XB-70 Valkyrie bomber. . .
. . .and the rocket-powered North American X-15 research aircraft. . .
Because of the rise of Inter-Continental Ballistic Missiles, most of these aircraft went by the wayside, as they were no longer relevant in the new strategic doctrine. Among all of its supersonic contemporaries, only a few others joined the SR-71 in service beyond the 1980s, eventually surviving one attempt at retirement in 1990, and lasting in service until 1998. In that time, the SR-71 flew tens of thousands of hours, including many thousands of hours above Mach 3. 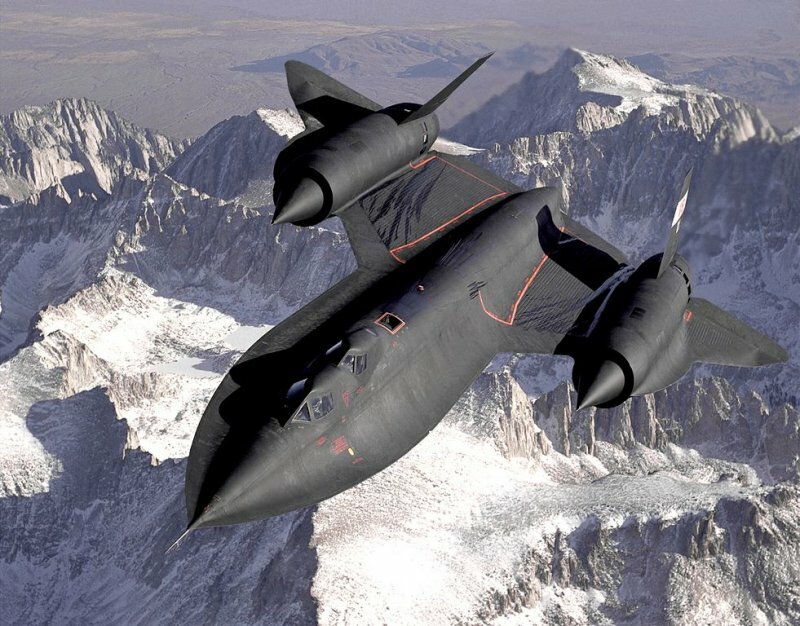 Even with the rise of spy satellites and drones, there are roles which only an aircraft like the SR-71 can fill, and much speculation exists about whether a classified replacement exists. 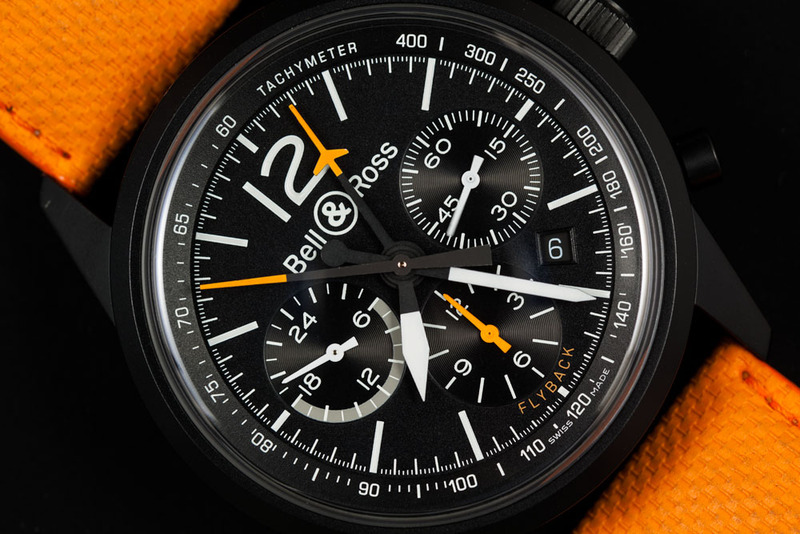 In honor of this unique aircraft, Bell & Ross has issued a version of their BR126 line, called the Blackbird, which in turn is special in having central chronograph second and minute counters. 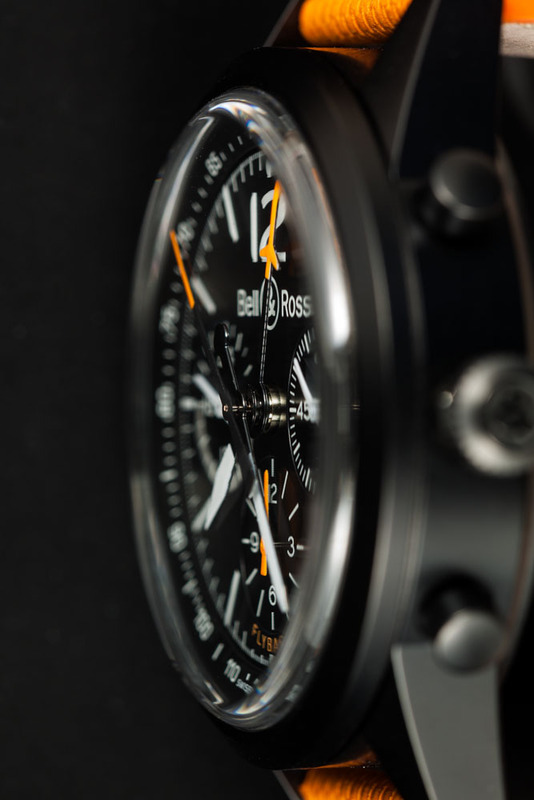 In the early days of Bell&Ross, the company worked closely with German watchmaker Helmut Sinn, and sold several models with the famous Lemania 5100 movement. This movement has garnered several distinctions, including being flight qualified by several militaries around the world, and furthermore having flown in orbit during a Space Shuttle mission. The Bell&Ross BR126 Blackbird joined by the Lemania 5100 equipped Space 2. 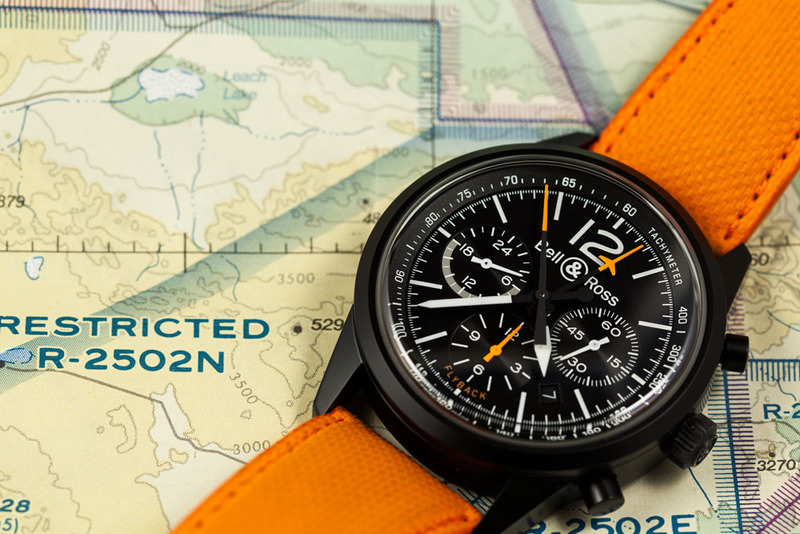 The primary feature of the Lemania 5100 was the the large central minute and second hand counters for the chronograph, which makes the chronograph extremely easy to read. Unfortunately, the tooling for the Lemania 5100 allegedly wore out just before the millennium, and no more movements are being produced. In addition, the Lemania movement, while very robust and flight qualified, wasn't the prettiest thing to look at, and in fact contained several plastic parts and stamped pieces that wouldn't put it on anyone's list of prettiest movements. For this limited edition watch of 500 pieces, Bell&Ross have used a special Dubois-Depraz automatic movement that recreates the four-way stacked hands of the Lemania 5100. In addition, the movement adds a very handy Flyback function - that is, the chronograph can be reset while running, without stopping first. 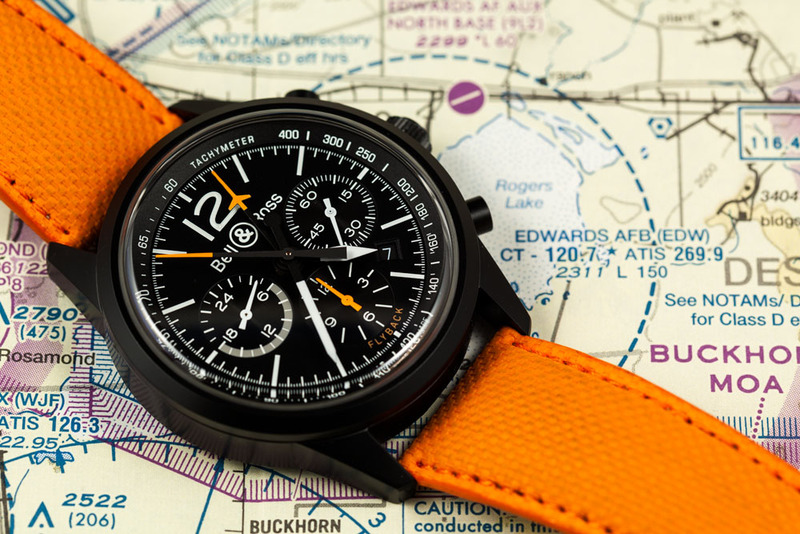 Flyback or "Retour en vol" is very handy for a pilot using his watch to time flight legs - it allows one to reset the chronograph immediately without having to stop and restart when a new flight leg is reached. 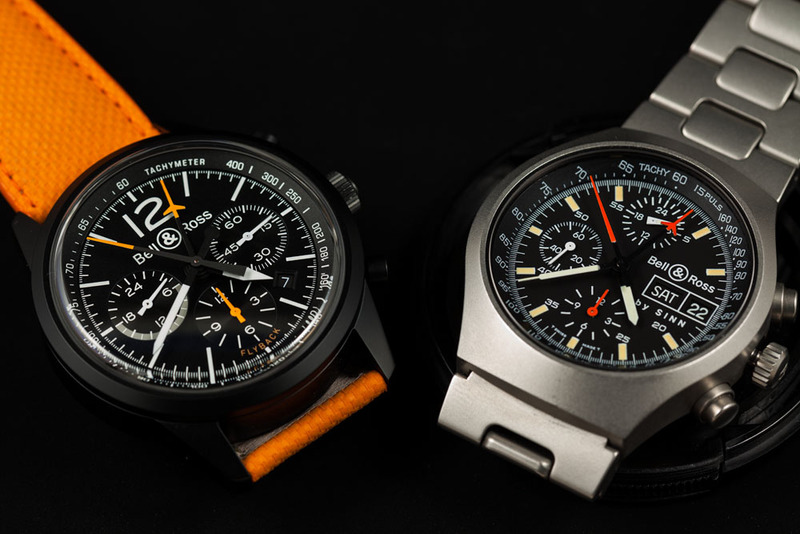 Rounding out the functions of the watch are the chronograph hour counter at 6 o'clock, the timekeeping seconds hand at 3 o'clock, and a 24 hour indicator at 9 o'clock. (Just like the Lemania 5100, this is not independently adjustable from the timekeeping hour hand, and serves as a day-night indicator.) There is a simple window date at 4:30, and a tachymeter scale runs along the outside of the dial. 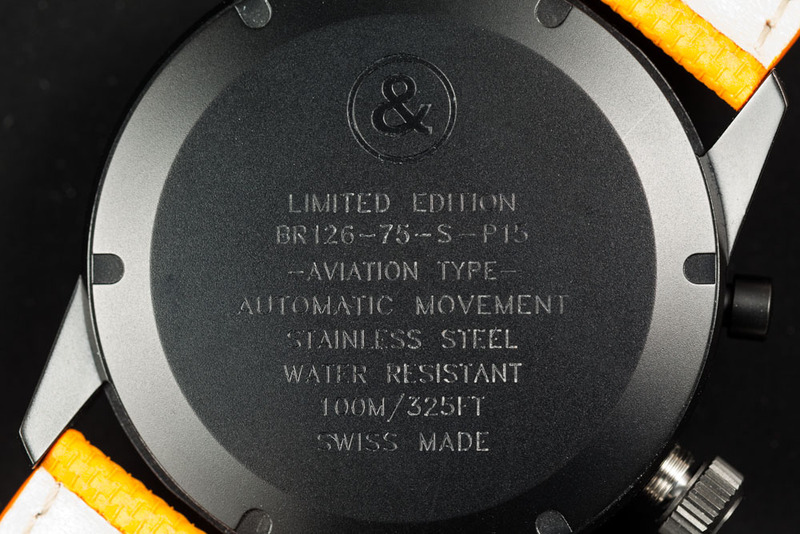 The 43mm case is made from stainless steel that has a matte PVD finish. The highly-domed crystal is made of sapphire, and is reminiscient of the acrylic crystals of the 60s, but with the benefit of scratch resistance. and the case is water resistant to 100m. 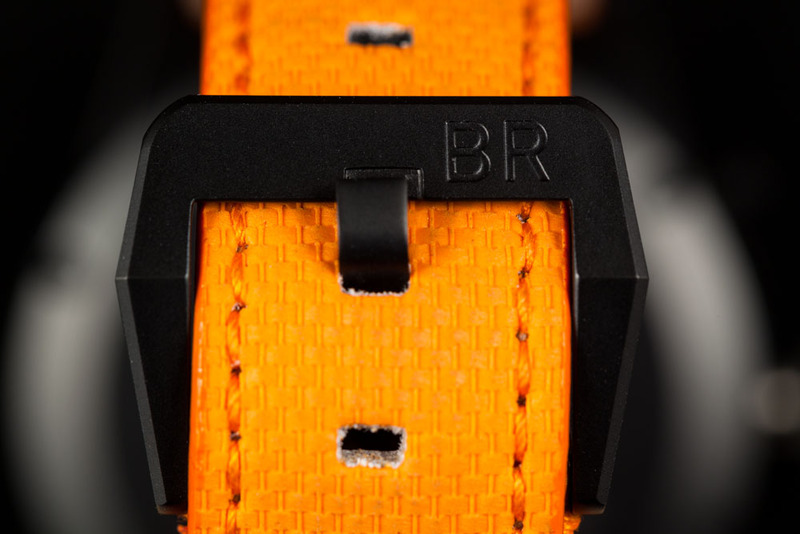 The watch comes with two straps: one in black rubber with a weave pattern, and one International Orange in canvas. 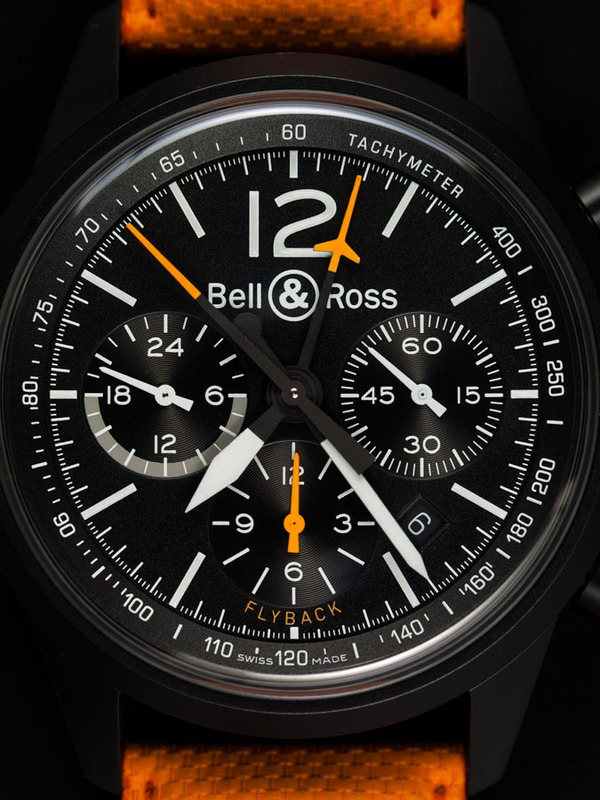 In conclusion, Bell&Ross have managed to create a unique watch that recalls their beginnings as a watch company and in turn have made it a fitting tribute to an amazing aircraft. All photographs of watches are Copyright © 2013 Edward Hahn, All Right Reserved. All photographs of aircraft are in the Public Domain, originally taken by US government personnel.